The 2017 Groundswell Lionfish Tournament will be held on Saturday, July 22 and will see the invasive lionfish captured, recorded, and served to attending crowds. The 7th Annual Groundswell Lionfish Tournament takes place at the Bermuda Institute of Ocean Science with the tournament kicking off at sunup and all boats must be at the BIOS dock for the 3.00pm weigh-in. The family friendly land event kicks off at 2.30pm and runs until 7.30pm and entry is free. 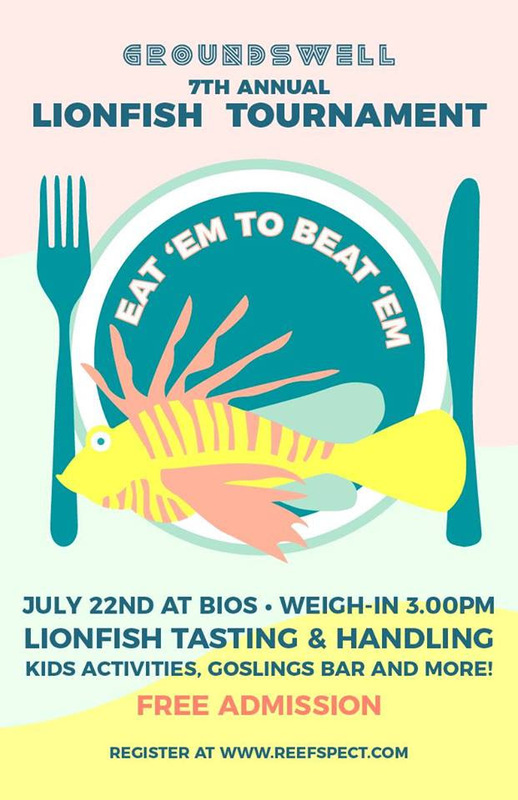 There will be lionfish handling demos, lionfish tasting, live music, DJ’s, Goslings bar and a kids arts & crafts area for the young at heart. Registration for the Groundswell Lionfish Tournament is open and those interested in participating are encouraged to go to www.reefspect.com and complete the application form. The registration deadline is 5:00pm on Friday July 21st. There will be a prize-giving after weigh in and prize winners and their fish must be present to receive prize. Prize categories include individual, largest fish, smallest fish, most fish, boat/group, and youngest culler. For more information contact Selange Gitschner selange@dasfete.com or Matthew Strong matthew@dasfete.com.